It's tough and strong, and a capable vehicle that is popular for car rentals in the area and is always high on the request list. The Volkswagen Touareg takes a step away from rugged style on the outside, and it looks smoother, classier, and more at home in suburban driveways. This model is sleek and stylish while also offering great control and speed with a powerful engine that fits into a small yet charming package. With a 5 seat and 5 door design getting in and out is easy and convenient no matter who or what you are transporting. 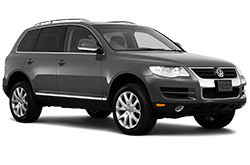 It has great millage rates and is packed with all the latest features and accessories you would come to expect from a luxury vehicle- try the Touareg today!